This year at my school, admin decided to try something new-D.E.A.R. time. Drop Everything And Read. Many of us middle and high school teachers were like what? We have to tell our students we have 30 minutes of D.E.A.R. time every week? I was already envisioning the jokes that would come from that one. 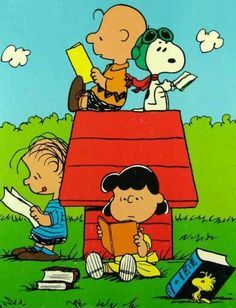 Nevertheless, once a week, the students literally set everything aside and read whatever they want (within reason of course). Here’s the best part...even teachers have to stop doing "teacher stuff" and read. Whatever we want! I'm excited, not sure about all my students though. Then came the bad news...no electronic devices. My elation deflated rather quickly and here’s why. When I lived in the States, I was always at the local library selecting new books to read. Then I moved to a foreign country that doesn’t speak my language. Finding English books became a real problem. So I turned to my Kindle for my reading fix. So for this post, I've decided to compile my top three favorite book series from my meager collection. 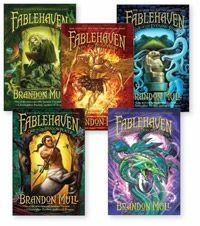 Fablehaven by Brandon Mull. My all time favorite series. This is the one that spurred me to write my own story. It’s full of magic and fairytale characters, humor and mystery. It’s the tale of a sister, the reliable one, and her younger brother, the not so reliable one. Since their parents are off on vacation, they get dropped off at their grandparent’s house in the middle of nowhere. Neither sibling is excited as they barely know these grandparents, and to make matters worse, they are given lots of rules and there’s no tv! What’s a kid to do? Fortunately for them, they discover their grandparents are the caretakers of a hidden preserve for magical creatures. But unfortunately for them, the newfound knowledge also brings about danger that deepens with every book, and then finally bringing about the exciting climatic end in book 5. Once I turned the last page of the last book, that deep disappointment set in that this was the end of the series. It was a satisfying ending, but it was finished. Then, a few years later, much to my delight, Brandon Mull decided to continue the series. I can't wait to see what is in store for my favorite story. The Unwanteds by Lisa McMann. Categorized as dystopian, this one is choke full of creativity. Alex lives in a society, Quill, where people are put into three categories: wanteds, necessaries, and unwanteds. Those who are labeled as unwanted, as with Alex, are sent to their deaths because, well, they aren’t wanted. These are usually those who display some type of creative ability. As Alex and the other unwanteds arrive at their final destination where they are to die, something unexpected happens. They aren’t eliminated but transported to a magical place called Artime where creativity lives and thrives. Throughout the seven books, we see Alex grow in his creative abilities and lead the people of Artime against those who wish to destroy them. Lisa McMann has done an amazing job building a world where what you can imagine in your mind can come to life through your magic. I especially love the sculpted creatures that come to life to teach the unwanteds at their school. The Grimm Legacy by Polly Shulman. Okay, I'm cheating a bit on this one. It's not technically a series although there is a companion book to this one, and she also wrote another one using one of the characters from The Grimm Legacy. But I'm going to include it anyway. Fairy tale lovers will love this one. It's set in a circulating material repository-a lending library of objects. Not all of these objects are what they seem as Elizabeth, the main character, soon discovers after she gets a part-time job there. A magic mirror, seven-league boots, and a flying carpet are just a few of the magical items hidden away at the library. In the midst of the amazement and excitement of discovering that magical artifacts really exist comes the terrible news that some of those very items are being stolen. It's up to Elizabeth and her new friends to figure out the mastermind behind the thefts. 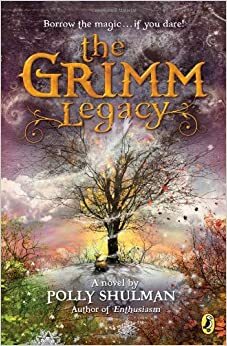 The Grimm Legacy is full of humor and high flying fantasy as Polly Shulman delves into the magical world of the Brothers Grimm. Just writing about them makes me want to read them again! But what about you? Have you read any of these? What is your favorite series? Drop me a line. I’d love to hear your thoughts! Great post, Julie! I haven't read any of these series yet, but they all sound like my kind of books! And I remember doing D.E.A.R. time back when I was in school - maybe I need to institute that at my house once my boys are old enough to read :) As for my favorite series, Harry Potter would definitely be up there. I also loved the Enslaved series by Katie Clark, the Books of Bayern by Shannon Hale, and the Hollow Kingdom trilogy by Clare Dunkle. I have a feeling there will be many additions to that list - I'm in the midst of so many series that haven't all been fully written yet! What a fun idea! Except for the print-only aspect. Perhaps you can suggest some new books to the librarian.